This year’s edition of the Grand Prix d’Horlogerie (GPHG), which took place on Friday night at Geneva’s Grand Théâtre, had to be the most emotional edition of watchmaking’s “Oscars” that I have ever experienced. This begins with the happily married couple of Maria Kristina and Richard Habring, otherwise known as Habring2. At home in Völkermarkt, Kärnten, the Austrian-Saxon watchmaking duo entered the GPHG for the second time in a row after unexpectedly winning the prize for the best sports watch at the 2012 edition. 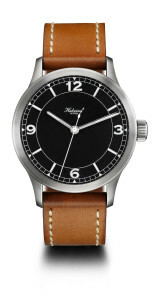 While for many, the Habring products may seem to have come out of nowhere thanks to the fact that the Habrings’ primary business is creating complications and movements for other brands, the reality is that they have been making highly interesting timepieces offered at realistic prices for many years. They only make about 50 pieces per year for the general public, which also makes them incredibly rare. Indeed, lightning struck twice and the Habrings once again took home a coveted GPHG prize, this time for the Jumping Second Pilot, a cleverly constructed timepiece outfitted with the rare-to-otherwise-non-existent jumping seconds complication. Presented as the second award, the Habrings’ emotional acceptance of the prize definitively set the tone for the evening: Maria Kristina publicly thanked her husband for their common vocation after which the two shared a short kiss – a premier in the history of the GPHG as far as I’m aware. The innovation prize presented another opportunity for an emotional moment, though this may not have been as obvious to the casual observer. 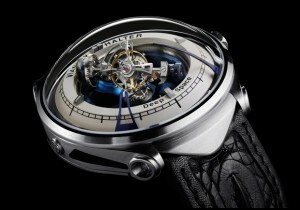 Independent watchmaker Vianney Halter won for his Deep Space Tourbillon – his first timepiece in seven years, the result of a dark period in his life that practically crippled the engaging artist’s imagination. The Deep Space Tourbillon, which has been highly critically acclaimed since its official introduction in June 2013, marks the personal and professional comeback of one of the most gifted watchmakers of our generation. 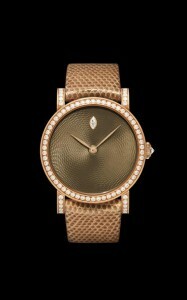 The prize for the best ladies’ watch went to DeLaneau for the Rondo Translucent Champagne, a surprise by anyone’s reckoning and a testament to the jury’s collective excellent eye when it comes to quality work done by true artisans to make unique timepieces. CEO Brigitte Morina was literally moved to tears onstage, making this unexpected win all that much more endearing. Benoît Mintiens is a Belgian industrial designer who hit a true homerun with the advent of his platform watch. 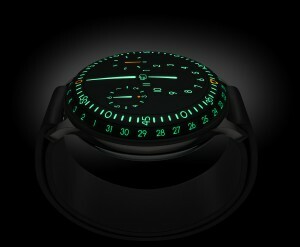 The Type 3, the third watch stemming from the initial idea forming the base of the small independent company Ressence, takes the platform idea a step further by filling the top of the sapphire crystal dome with liquid, which makes for a unique, strong visual presence of the handless, crownless timepiece. Mintiens was visibly moved on stage as he accepted the prize for the Horological Revelation (awarded to a company younger than five years). After the show, it was revealed that an incredibly famous French designer had even ordered one after having had the chance to see it up close as part of the Grand Prix d’Horlogerie jury duties. If that is not the highest expression of acceptance that one designer can give another, then I wouldn’t know what is. Before the biggest and final prize of the evening was given out, jury president Aurel Bacs took the stage to award the Special Jury Prize, which he did with great emotion and relish. 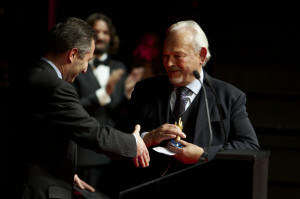 Indeed, this special award went to Philippe Dufour, the 65-year-old watchmaker from Le Sentier universally regarded as the world’s greatest living watchmaker. Though he has “only” created three watches under his own name over the course of his career – Grande et Petite Sonnerie, Duality, and Simplicity – he has contributed to the world of horology in ways that cannot be quantified. Passing on precious knowledge of hand skills, mentoring upcoming generations, and paying tribute to traditional watchmakers of his region, the Vallée de Joux, are just some of the ways in which Dufour has contributed to the general good of Swiss (and foreign!) horology. By the time he was done speaking to the unusually silent crowd of about 1,500 people, there was hardly a dry eye in the house. Then on to the main prize of the evening: the Aiguille d’Or. This timepiece is chosen by the jury from all 71 of the preselected timepieces as the best watch of the year and was presented by the president of Switzerland, Ueli Maurer. 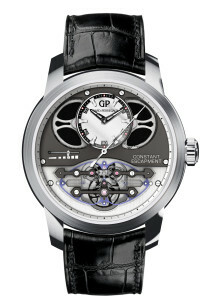 Though to any industry insider it was hardly a surprise that this watch would walk away with an award on this evening of all evenings, it may have been surprising that Girard-Perregaux’s Constant Escapement would go home with this award in particular as its premise is highly technical. So let’s quickly recap what makes the Constant Escapement such an important piece. A conventional Swiss lever escapement portions out the energy in a mechanical movement, making it workable. An element watchmakers and engineers now more often search to advance in the modern era is that with dwindling energy near the end of a winding period, escapement accuracy also lags. To improve this, watchmakers sometimes look to employ “constant force,” which is very rare and usually achieved only with the help of an intermediate spring placed in the escapement called the remontoir, which creates an artificial type of consistent energy. Then-owner of Girard-Perregaux Luigi Macaluso was presented with an idea to solve this in a different way using new technologies and non-traditional materials, which excited him and led to an ensuing seven-year development. The Constant Escapement boasts a completely new shape and highly visible engineering structure, which makes true constant force possible. Thus, theoretically, this escapement remains evenly accurate for an entire winding period.